Gan (geese) evokes Meiji-era Tokyo: its alleyways, rivers, mansions, poverty, and occasionally tense class interactions. Okada, a student at the most prestigious university in Japan becomes entangled in the romance of a disenfranchised woman and an ethically suspect merchant. At a time of rapid social change, Mori examines the social and economic pressures that continue to bind it's characters, who yearn for freedom. Circumstance, rigid social structure, and the familial and financial obligations drive the characters forward to Gan's powerful ending. 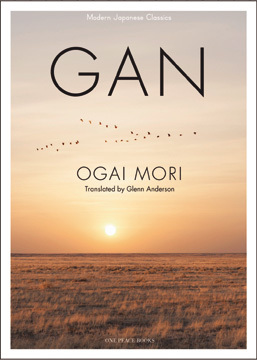 Notable for it's deep exploration of character motivation, as well as its wonderfully elaborate female characters, Gan is an exceptional example of early 20th century Japanese Literature. It looks on a changing world, explores its faults and glimmers of hope, and lingers for a moment, bittersweet, at the thought of it's passing. Born in 1862 in modern-day Simane prefecture, Mori was born to a family of doctors to the Feudal lord in the area. With the Meiji Revolution, the family relocated to Tokyo, where Ogai was to study medicine and the German language. He enlisted in the army and spent four years in Germany. Upon returning to Japan he started his own literary journal and medical journal, both of which were highly influential. Considered, along with Soseki Natsume, the preeminent Meiji-era writer of Japan, Mori's romantic, dense style exerted a powerful influence over following generations of writers. Gan is is most famous work. He died in 1922.